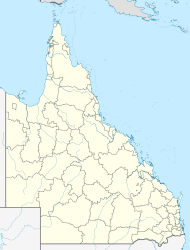 Nathan is a suburb in the City of Brisbane, Queensland, Australia. In the 2016 census, Nathan had a population of 1183 people. Nathan is home to Toohey Forest Conservation Park, Griffith University's Nathan campus and the Queensland Sport and Athletics Centre which hosted the opening ceremony of the 1982 Commonwealth Games. 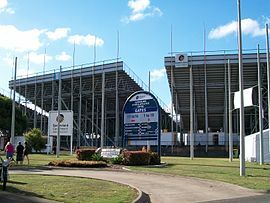 The Queensland Academy of Sport currently uses the facilities located at the stadium. The Mount Gravatt Cemetery is part of Nathan. With just 1,549 residents, Nathan remains sparsely populated, with much of the park and university campus being filled with eucalypt forest, grass trees, banksia and leptospermum. Local fauna include tawny frogmouths, powerful owl, hoary wattled bats, sugar gliders, greater gliders, squirrel gliders, flying foxes and possums. Surrounding suburbs include MacGregor, Robertson, Salisbury, Coopers Plains, Tarragindi, Holland Park and Upper Mount Gravatt. The Mount Gravatt Cemetery and Crematorium is located in the suburb along Mains Road. The Mount Gravatt cemetery opened in 1918. The suburb was named on 1 August 1967 after Sir Matthew Nathan, Governor of Queensland from 1920 to 1926. Toohey Forest Environmental Education Centre is an Outdoor and Evironmental Education Centre at South Ring Road (27°33′10″S 153°03′27″E﻿ / ﻿27.5527°S 153.0574°E﻿ / -27.5527; 153.0574﻿ (Toohey Forest Environmental Education Centre)). In the 2011 census the population of Nathan was 1,397, 48.4% female and 51.6% male. The median age of the Nathan population was 24 years of age, 13 years below the Australian median. Almost half of the population (41.4%) were aged in the range 15-24, compared to the national average of 13.3% in this range. 65.3% of people living in Nathan were born in Australia, compared to the national average of 69.8%. The other top responses for country of birth were New Zealand 3.6%, China 3.4%, England 2.9%, India 2.2%, Germany 1.1%. 75.6% of people spoke only English at home; the next most popular languages were 3.2% Mandarin, 1.5% Cantonese, 1.2% Vietnamese, 0.9% Indonesian, 0.8% Hindi. The most popular religious affiliation was "no religion" (32%), followed by Catholic (21%) and Anglican (13%). It is a culturally diverse suburb, with nearly 30% more overseas-born residents (27.57%) than the Brisbane average (21.03%). Although populated by local Aborigines until the 1940s, less than 1% of residents are indigenous Australians today. ^ a b Australian Bureau of Statistics (27 June 2017). "Nathan (SSC)". 2016 Census QuickStats. Retrieved 20 October 2018. ^ "Moorooka Ward". Brisbane City Council. Brisbane City Council. Archived from the original on 12 March 2017. Retrieved 12 March 2017. ^ a b "Nathan - suburb in City of Brisbane (entry 44216)". Queensland Place Names. Queensland Government. Retrieved 11 December 2018. ^ "Toohey Forest Park (Place ID 17672)". Australian Heritage Database. Department of the Environment. 14 May 1991. Retrieved 11 December 2018. ^ a b "Mount Gravatt Cemetery and Crematorium". Brisbane City Council. 4 October 2013. Archived from the original on 30 October 2013. Retrieved 20 October 2013. ^ Roberts, Beryl (1991). Stories of the Southside. Archerfield, Queensland: Aussie Books. p. 9. ISBN 0-947336-01-X. ^ "State and non-state school details". Queensland Government. 9 July 2018. Archived from the original on 21 November 2018. Retrieved 21 November 2018. ^ "Toohey Forest Environmental Education Centre". Retrieved 21 November 2018. ^ a b c d e f Australian Bureau of Statistics (31 October 2012). "Nathan (State Suburb)". 2011 Census QuickStats. Retrieved 11 February 2013. "Nathan". Queensland Places. Centre for the Government of Queensland, University of Queensland.